The very best way to recharge your thirsty soul is to go all in and get away on a short term mission trip! Life is distilled down to the ONE THING - serving as a team member for Jesus. 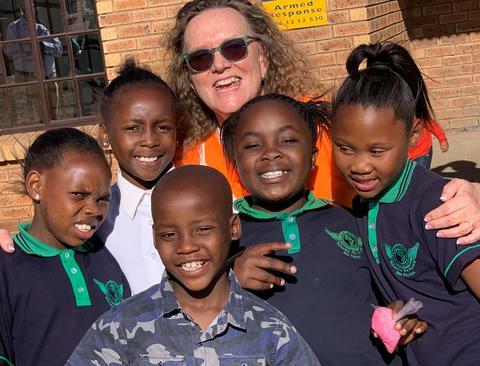 My husband, David, and I were grateful to serve on an eyeglass team in South Africa – the first team to be on the ground since the establishment of a permanent eyeglass clinic on the St. Peter Middelburg campus. This project was made possible because of the collaboration of the Michigan District, MOST Ministries, and COFA (Christian Outreach for Africa). 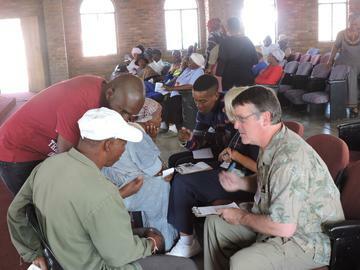 Imagine being surrounded by spirit filled team members and South African Christians who are so pleased to have you there that they sing praises every chance they get, go without meals to continue serving their community members with eyeglasses, and ooze love to everyone they come in contact with! Our fellow South African team members accepted our guidance and teaching, never appearing to receive it as criticism -- this on-the-field team training was especially meaningful because as the five days of vision testing progressed, the South African team members were able to complete their own eyeglass clinic training and take over as proprietors of the clinic. 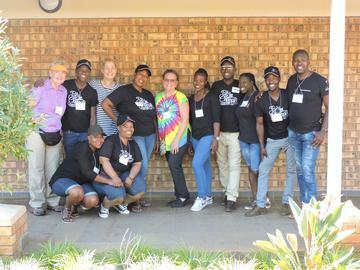 The South African team will continue eyeglass clinics in our absence through the Caring Friends organization located on St. Peter Middelburg’s campus. Through this week of training, we were able to “teach a man to fish” – and this permanent clinic will help them both earn a living for themselves and their families and provide a much needed service for their fellow man! The hundreds of people who were tested and received glasses at a cost they could afford were patient, friendly, and grateful. Waiting in line for a LONG time did not erode their demeanor one bit. The joy and happiness that people showed after having their vision improved by a pair of glasses was very uplifting. A mission team experience is a window into how Christ must have felt as He sought to alleviate human pain and suffering. Watching others serve brought tears to our eyes as their generous, Christ-like ways were demonstrated and we learned from them. David and I don’t get to serve together like this, so it was a real blessing to share the experience with each other as well! Another great aspect of a MOST trip is the day to day interactions with local residents. You are so much more than just a tourist on vacation. The value of being with people in their own homes, their own churches and their home towns cannot be quantified. It really makes us realize how many of our problems are just “first world” problems. We always start out on MOST trips intent on using our skills and energy to help others. We also hope that we are able to represent Christ and be good witnesses through service. Yet, each time, when the mission trip is over, we are amazed at how we have been helped, how we are lifted up, and how our faith has been strengthened. Mission teams help us realize that Christ is present everywhere; just as there are Christians everywhere – and we are looking forward to reuniting with them and with Jesus in heaven one day.